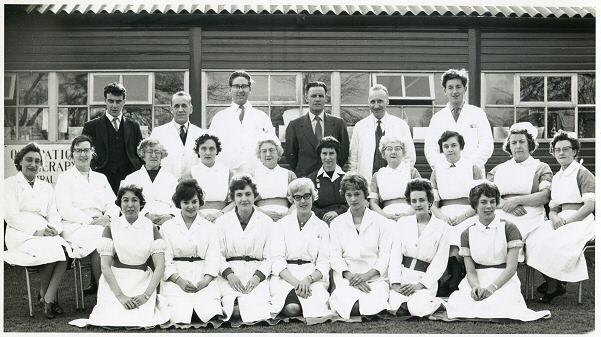 This is Theresa Girvan (Third from left in middle row) with work colleagues from the Occupational Health Department. Occupational therapy included indoor and outdoor activities. Dance and entertainment with some educational sittings such as discussions was also part of the programme. Photo taken early 1950's and supplied by Theresa's daughter, Mrs Angela Hallam. 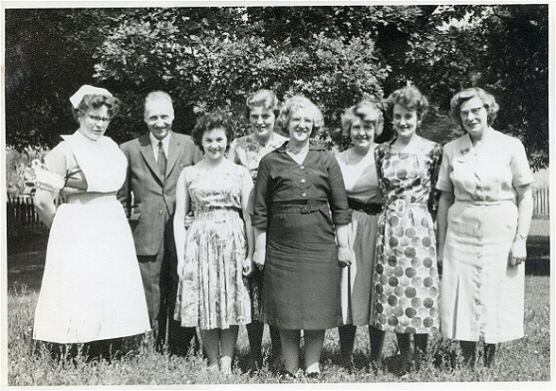 Theresa Girven (Middle of picture in dark clothes) worked at the Occupational Health Department for approx. 10 years. Photo taken early 1950's and supplied by her daughter, Mrs Angela Hallam. 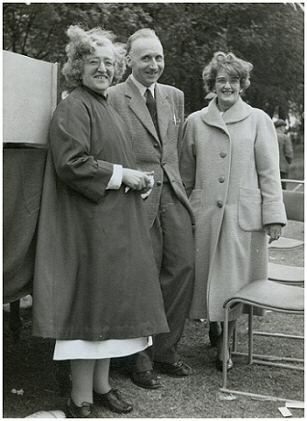 Theresa Girven (Left) on the grounds of the hospital, probably during outdoor activities for the patients. 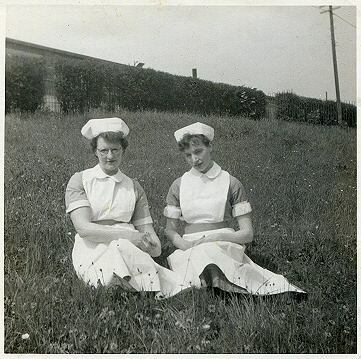 This is Joan Worne (nee Booth) (right) on the grounds of the hospital near the bungalow. was probably taken on a Sunday and she was 23 years old. 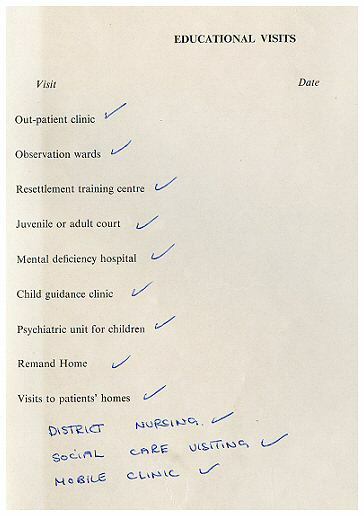 My Recollections of Middlewood Hospital 1957-1962 approx. By Joan Worne (nee Booth) May 2009. “50 years ago I was employed at Middlewood as a nursing auxiliary. I was issued with 3 green uniforms, a set of keys and a laundry number 243. My hours of duty were 6am – 2pm and 2pm – 10pm alternate weeks. I first gained experience helping with the day to day routine of the patients. I remember the overcrowded dormitories with very little space between the beds. Each bed had to be made up with the openings on the pillowcases away from the doors. The top blankets were neatly turned down approximately 18 inches and all the caster wheels had to face the same way. At night the patients removed their everyday clothing and it was re-made up into a ‘Bundle’ for the following day. Having little possessions of their own, what they were issued with must have been important. Rows and fights were a common practice if 'Items’ went missing. 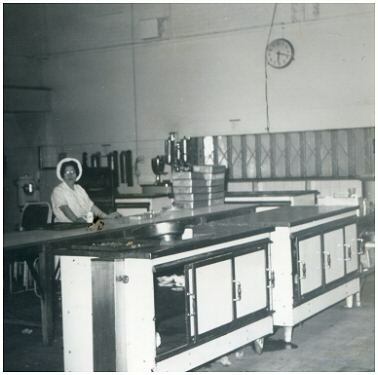 Each ward had a day room/breakfast room after which, work duties would be performed by the more able patients. However, most were in their own little world and difficult to motivate. Certain days of the week were allocated to treatment, mainly electro convulsive therapy which would calm aggression or violence. 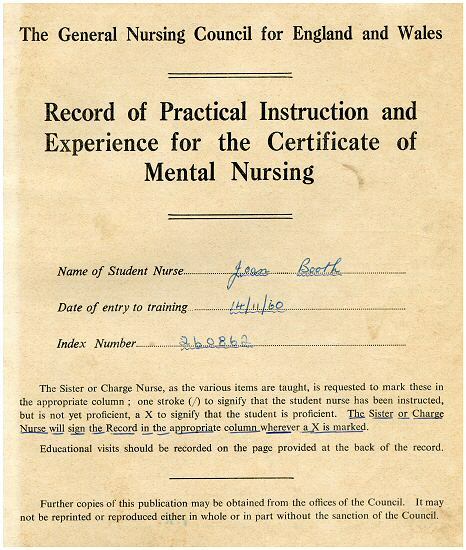 I later became a student nurse and studied hard to become a registered mental nurse (R.M.N.). Nursing School was really enjoyable and the work had added interest within the outside community i.e. district nursing. Remand homes, Law courts etc. mostly as part of a psychology course. I had some really happy times at Middlewood, also some scary ones. I actually met a Ghost during my time working on the Bungalow (A sick ward with side rooms for contagious patients). Just before visiting time I saw a woman come into the ward and walked into one of the empty side rooms. The outer door had not yet been unlocked so visitors were still outside. I proceeded to see why she had entered the building. I reached the side room — and it was empty! Most of the hospital is gone now. I have walked around the area of the new housing and it is difficult to find ones bearings. Some of the old paths exist and have steps leading down towards the main buildings. The ‘Key Lodge’ at the Middlewood Road entrance is still there and also the remains of the church. 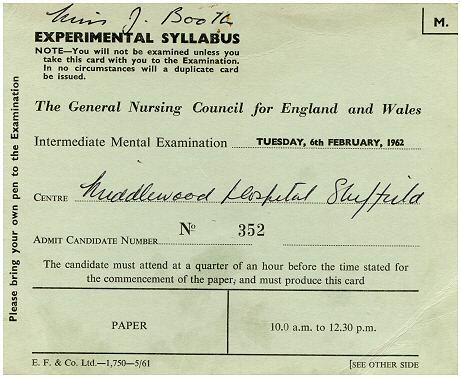 This is Joan's intermediate mental examination attendance card dated 16th February 1962. The card clearly indicates to all candidates to bring your own pen. them of the consequences if they fail to comply. and also confirmed her entry to the nursing course. 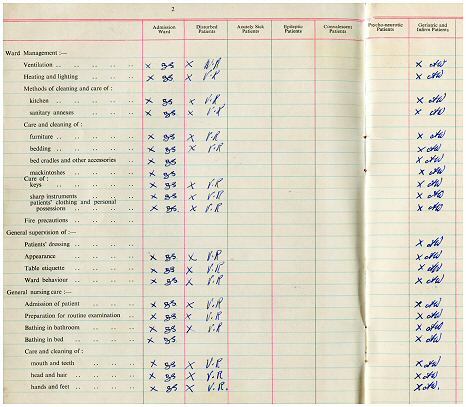 The evaluation booklet contains several pages listing tasks to be taught by the Sister or Charge Nurse. 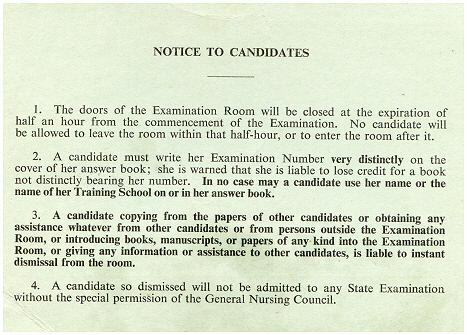 A 'X' signify that a student nurse has been instructed. The card indicates that there are three types of patients needing different levels of care. They are patients from the admission ward, geriatric and infirm, and patients from the disturbed wards. Nursing tasks ranged from bathing patients in the bathroom to psychological methods of treatment such as persuasion and reassurance. During training it was felt that knowledge from other areas of our social life was essential, and so visits to outside places such as a Remand Centre or visiting patients at home would give greater scope of knowledge to student nurses. This is Joan's Mother who worked as a cook in the hospital between 1969-70 approx. Her pattern of work included regular early morning shifts. The clock on the wall indicates 06:20 AM. Photo supplied by Joan Worne.